IT HAS BEEN a lovely start to the long weekend today with the sun beaming down on everyone. If you happened to be strolling around Dublin City, you may have spotted some swimmers in the Liffey and thought they were just making the most of the good weather. 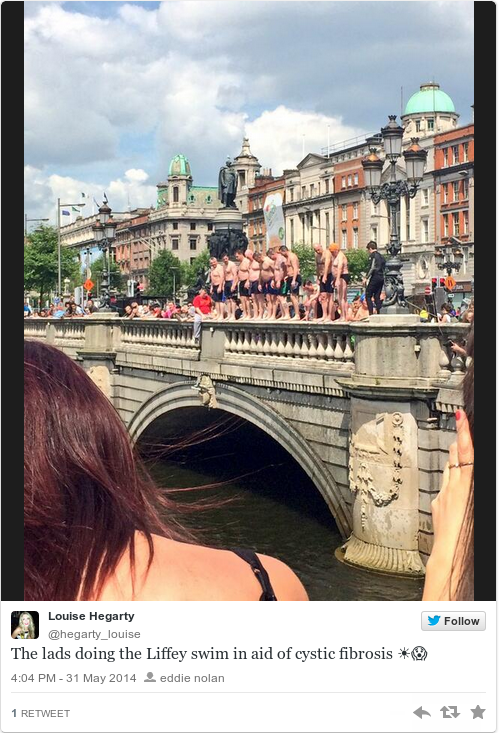 They were, in fact, jumping into the smelly water for charity, not just for the craic. Got any good snaps of you enjoying the good weather? Send them to tips@thejournal.ie. Email “Pics: Brave swimmers take to the Liffey for charity”. Feedback on “Pics: Brave swimmers take to the Liffey for charity”.